The internationally recognized recycling symbol is instantly identifiable. This symbol serves a variety of purposes. The recycling symbol is highly distinctive. It is formed of three arrows that point in a never ending loop. The arrows form a triangle shape. The symbol is based on the mobius strip. The mobius strip is a loop that contains a half twist. This has no beginning and no end. This is relevant to the recycling symbol as it helps to demonstrate the ongoing nature of recycling and the long term implications. The symbol can be any color, however it is often produced in green. This is because the color green symbolizes the environment and, of course, green issues. The symbol is used on many products, including paper, plastics and even computers. The recycling symbol was designed to coincide with the first Earth Day in 1970 to help to promote the benefits of recycling. The symbol was created as part of a contest that was sponsored by the Container Corporation of America. The company invited art and design students from all over the country to design a symbol that could be used to help raise awareness of environmental issues. The contest was won by Gary Anderson, a student at the University of Southern California. The symbol has since been adopted worldwide as the symbol of recycling. The recycling symbol is in the public domain and no one owns the copyright on it. This means that individuals, governments and corporations worldwide can use the symbol without restrictions. The international nature of the recycling symbol means that it is instantly recognizable and the single symbol can be used. This also means that the symbol can be adapted and varied. There are many stylized versions of the symbol available. These have been adapted for aesthetic reasons or to make the symbol a little more individual or original. Although the symbol is often adapted, the basic structure of the pointing arrows remains the same. One of the main ways that the symbol has been adapted is to contain information about the amount of recycled materials that have been used to create an item. This is represented as a percentage in the center of the symbol. A figure of 20 percent in the center of the recycling symbol means that 20 percent of the materials used in a product have been recycled. The plastics industry has developed a system that gives information about plastic products and how they should be recycled. This information is incorporated into the recycling symbol. There are many ways that the recycling symbol can be used. In addition to manufacturers using the symbol to provide essential information about the contents of an item and recycling details, local authorities use the symbol to identify recycling points. Individuals can use the recycling symbol too to raise awareness of recycling issues. The recycling symbol is readily available as clip art and in other downloadable formats, allowing it to be incorporated into literature and posters with ease. Planet Pals - There are a wide range of different symbols here that are suitable for many uses. Open Clipart - This site offers a variety of different recycling symbols, from the traditional design through to symbols that are a bit different. Clipart Library - This site offers traditional and stylized recycling symbols available for free download. The recycling symbol plays an important part in modern life. 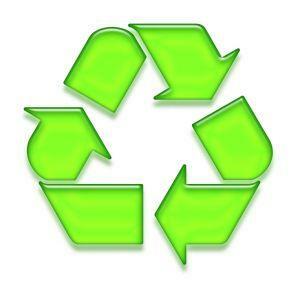 The symbol helps to share important information about recycling as well as giving a common focus the world over. Using the recycling symbol to raise awareness of recycling and to promote the green living cause has long term and far reaching benefits.